Childhood is fleeting! The years go by in the blink of an eye. 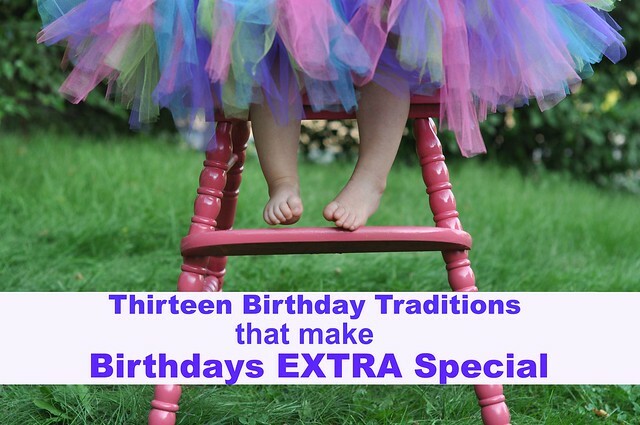 Because of that, we make sure our kids have extra special birthdays! Birthdays have been on my mind a lot lately. 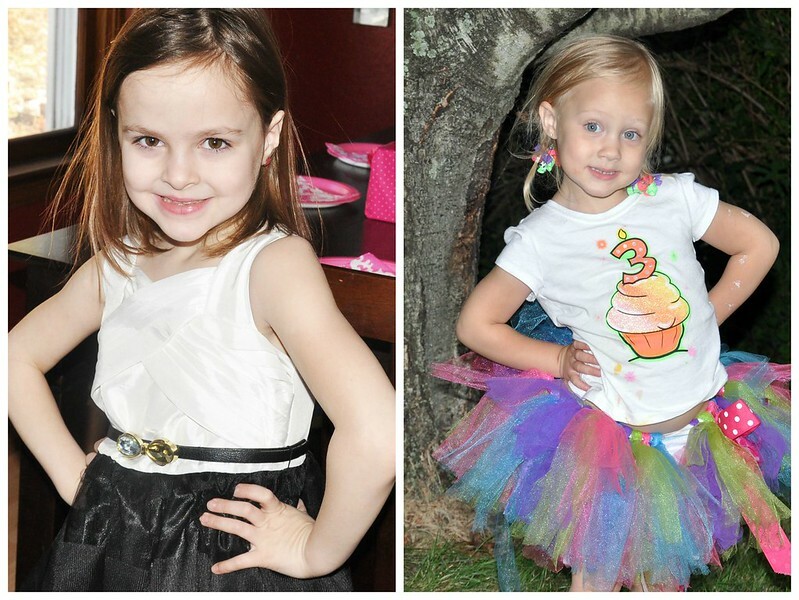 On Monday, my sweet Liliana will be four! Two weeks later, my BABY will be two. 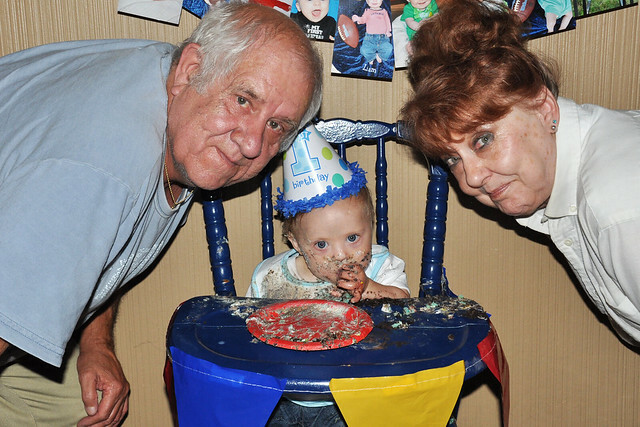 Right in the middle of their birthdays, we will be having a combined party to celebrate with our family and friends. August is going to be full of celebrations! 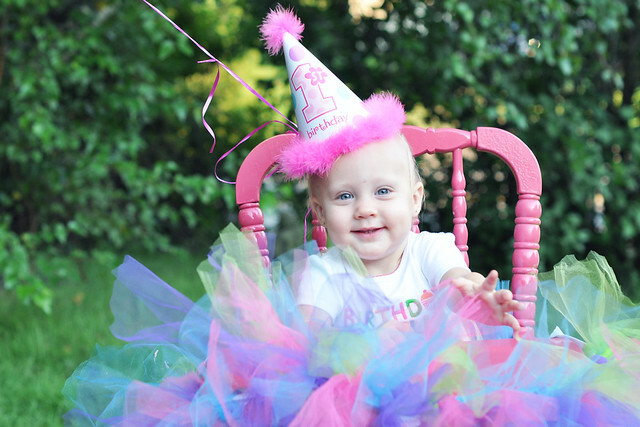 Over our decade of parenting, we came up with some fun birthday traditions that we do every year! Fill up the bedroom with balloons!!! After our child falls asleep on their birthday eve, we blow up balloons and sneak them into their room while they are sleeping. 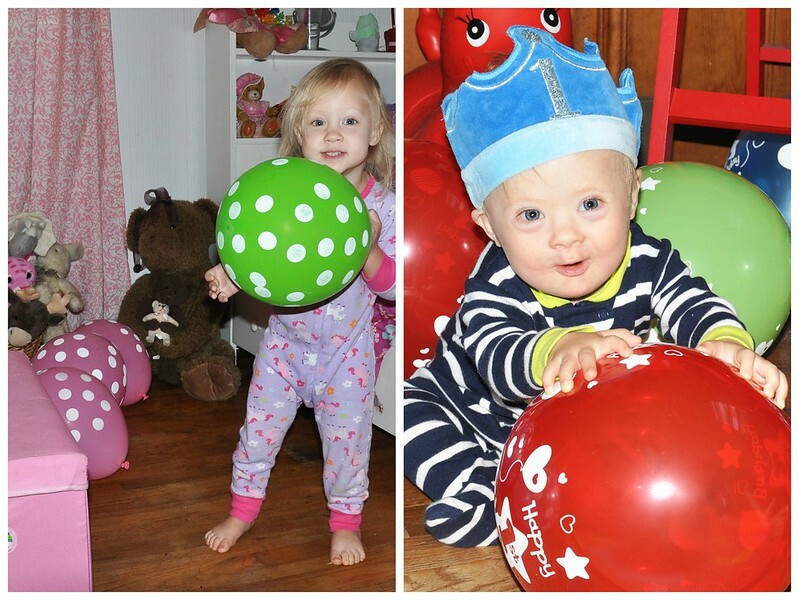 The first thing they see when they wake up on their birthday is a bedroom full of balloons! Decorate the bedroom doorway with streamers. 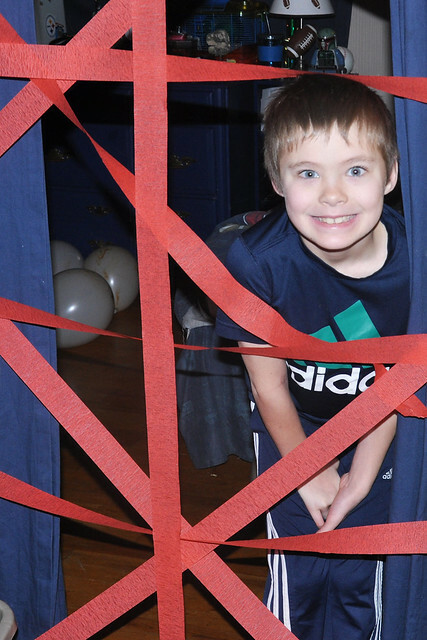 Sometimes we create a curtain of streamers, but other times, we create a streamer trap! The kids think it's hilarious! Have a doughnut breakfast! Our kids love doughnuts. 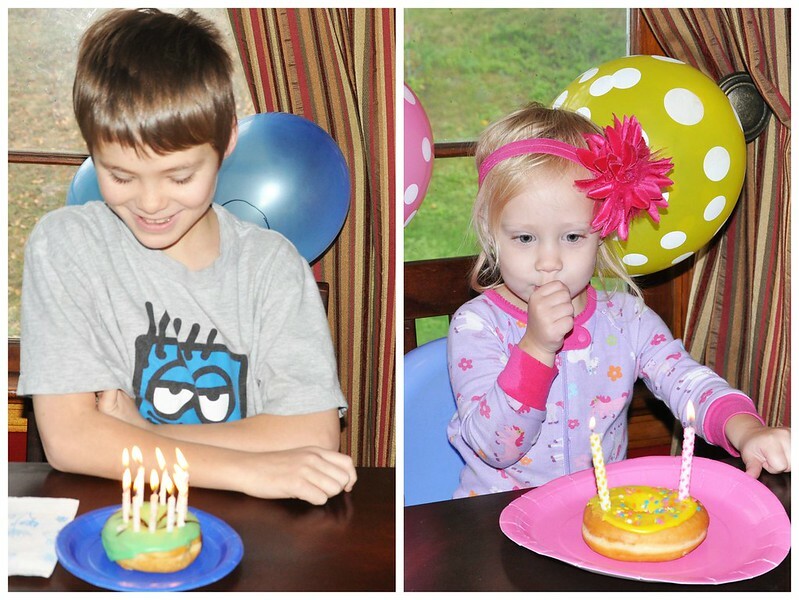 On birthdays they get a doughnut for breakfast with a lit candle and their first birthday song of the day! 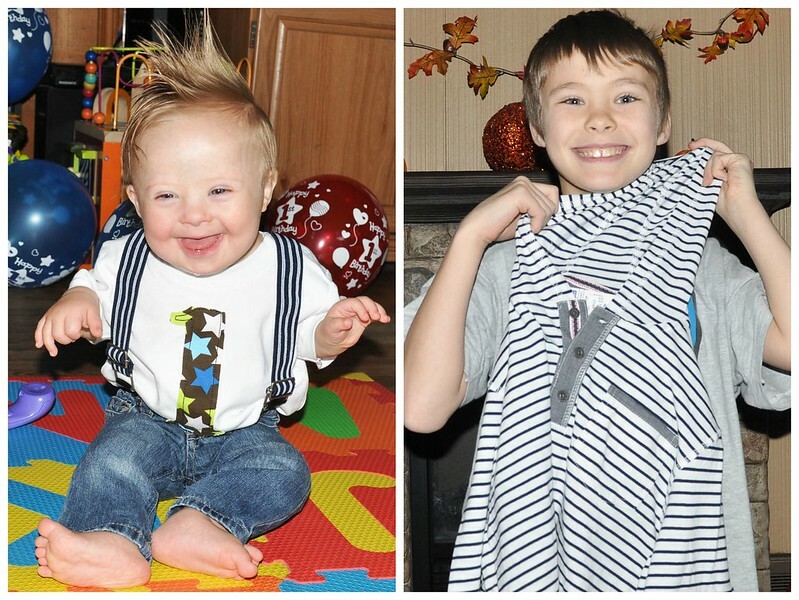 Buy them a special birthday outfit to wear on their birthday. I love picking out birthday outfits. While they're sleeping, I hang it up in their room. 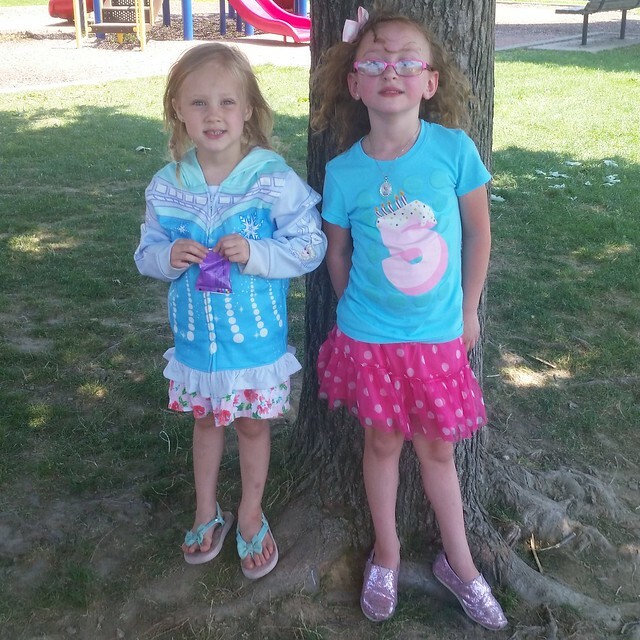 They love waking up to a fun, new outift! 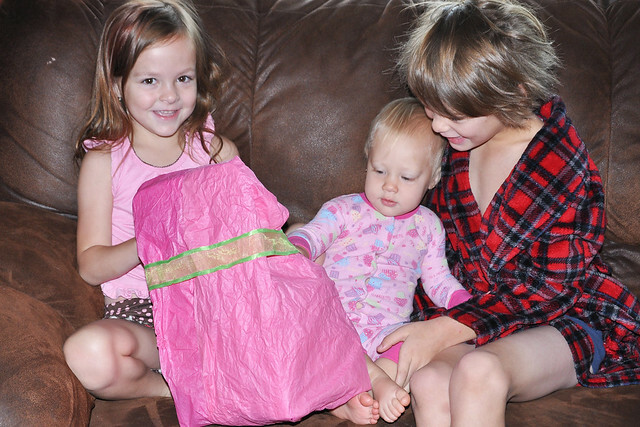 Have each sibling give the birthday boy/girl a small gift. Although each child gets a big gift from Grant and I on their birthday, they also get a small gift from each of their siblings! The kids love shopping for each other! Choose a special activity for the day. 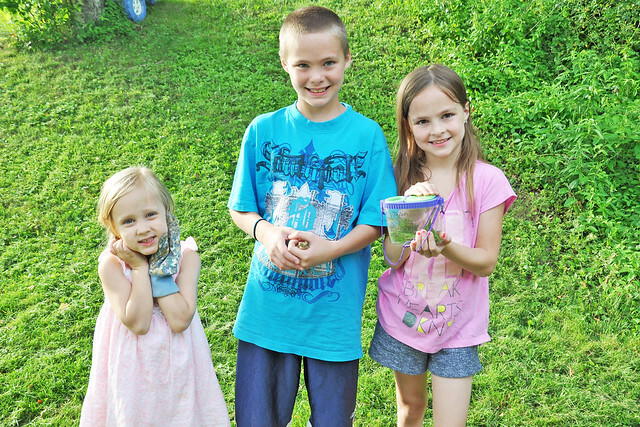 Lily and Liam have summer birthdays, but Dylan and Lexie's birthdays are during the school year. Quite a few times, they had to go to school on their birthdays. 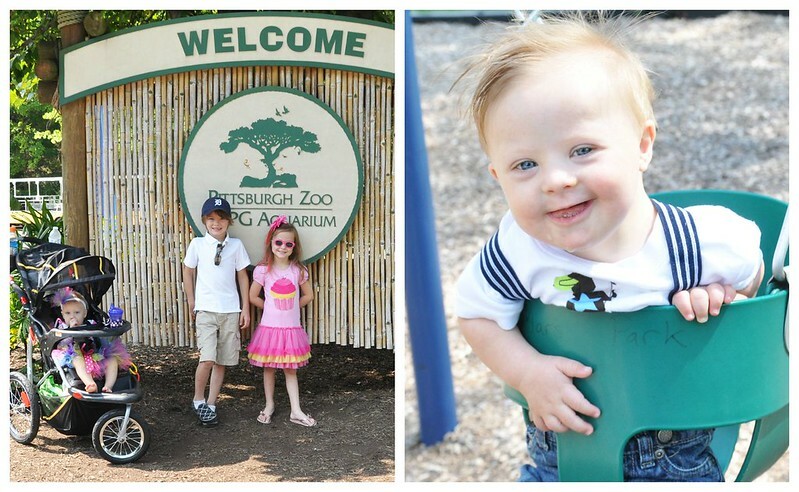 However, the birthday kid gets to pick a special outing on their birthday, whether it be a trip to the park or a trip to the zoo! Let the birthday kid choose a restaurant where they can have a special birthday dinner. Our rule is this: On your birthday, you get to pick where our family goes out to eat. The big kids choose actual restaurants, but Lily is still in the Burger King/McDonald's phase. Have your own mini party on your actual birthday. We always end birthdays with cake, ice cream, and the birthday song. 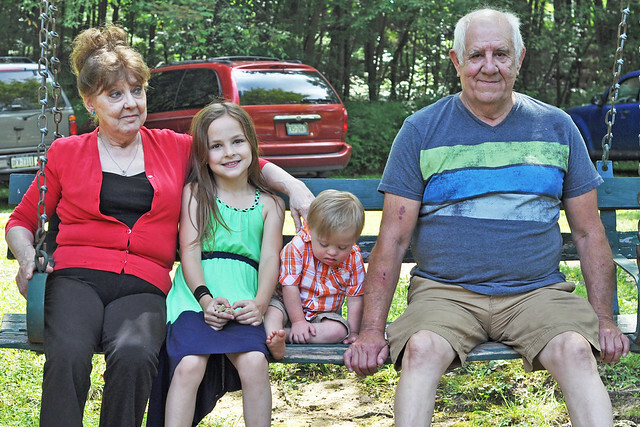 Grandparents always join us! Have a Birthday Party with friends and family. Don't go overboard. I promise the kids won't notice all the details. 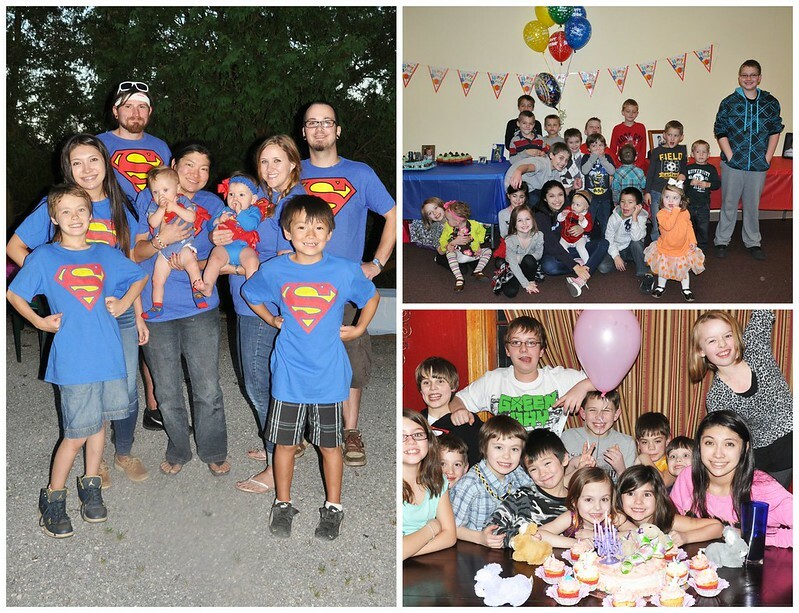 We always have a casual party with friends and family for each child's birthday! It's never anything over the top. 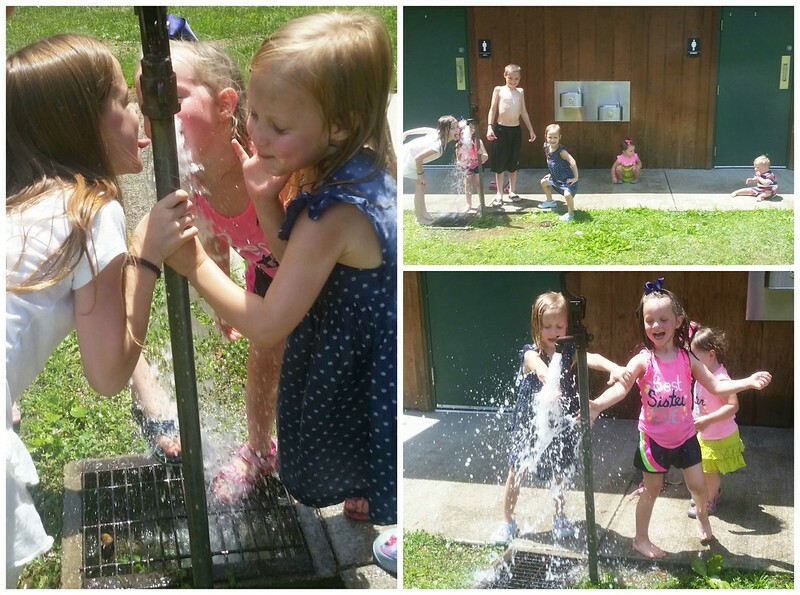 I've learned that the kids have fun no matter what! 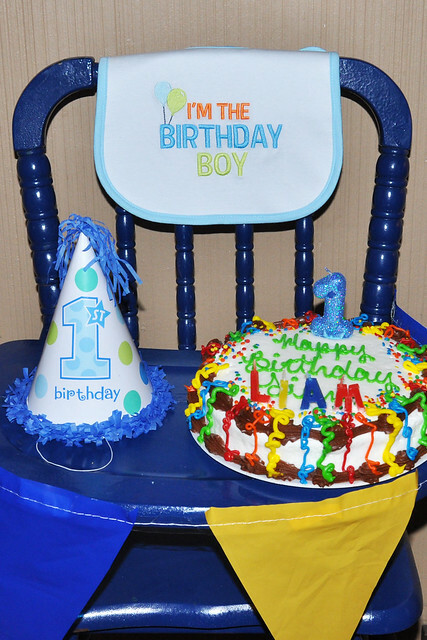 Create a special birthday cake tradition. Get it from the same place every year, make it yourself, or have a friend or family member make it. My mom makes every single birthday cake for my my kids! 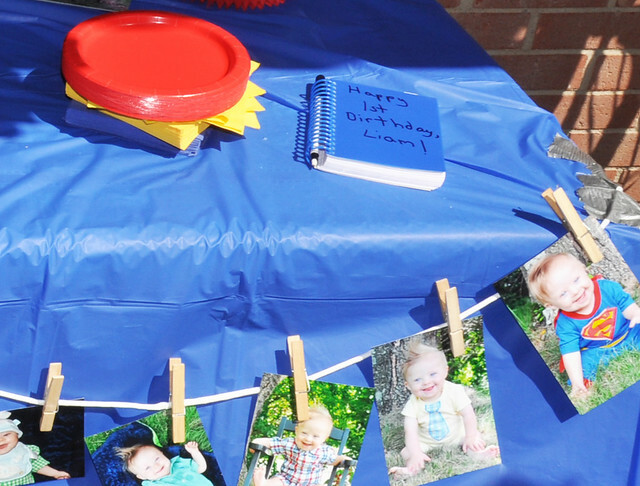 Have a Birthday Party Guestbook. This is a new tradition that we started last year that turned out to be a hit! I bought a mini notebook for each child, then let each birthday party guest leave a short, meaningful message in the book. After the party, I stored it in a memory box. Have a Birthday Photoshoot every year! 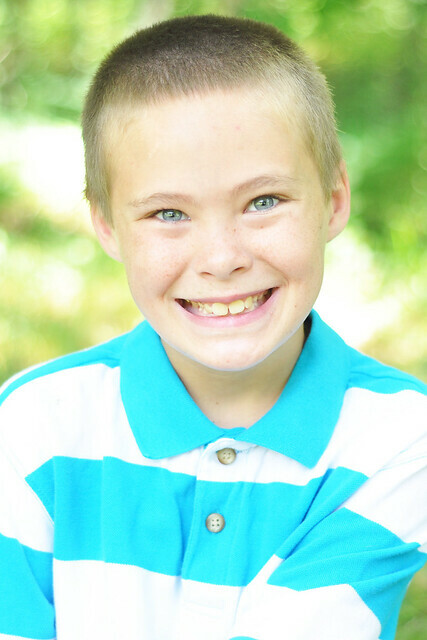 My kids get a birthday photoshoot (taken by me) every year to document a new year of life! 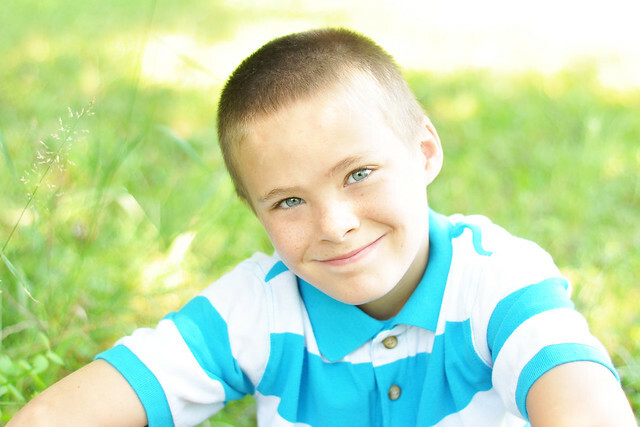 Start writing a keepsake birthday card or birthday letter to your child. It's a great way to reflect on the year. 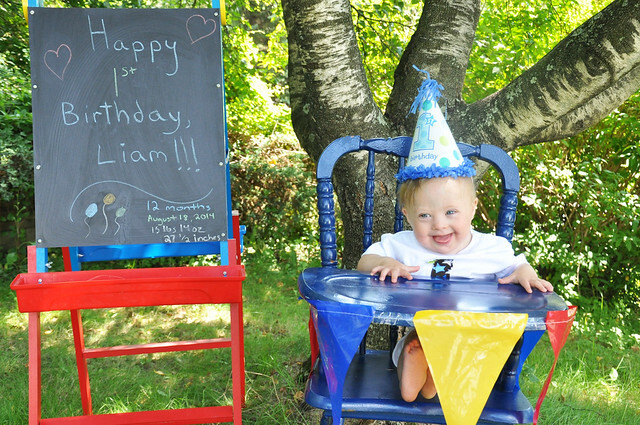 Every year, on each birthday, I sit down and write a heartfelt letter to my child, while my tears fall. 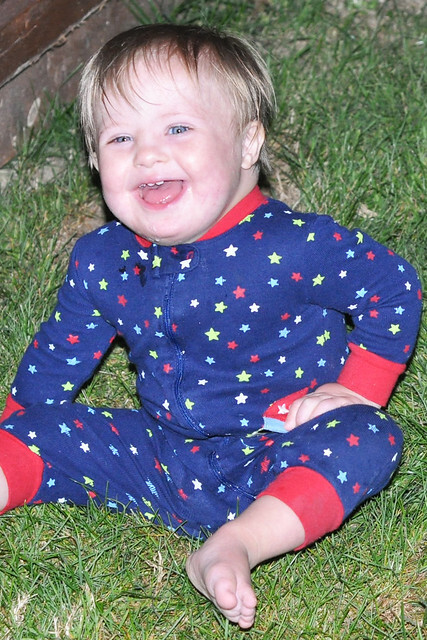 I give a few details about the past year and let my "baby" know just how much they are loved. Although I now give the cards to Dylan and Lexie to read, the letters/cards from previous years are stored in a box to be given to them when they are older. I hope one day my kids will read through 18 years of letters and realize how special they are to me and that I will ALWAYS love them. That's what really matters. 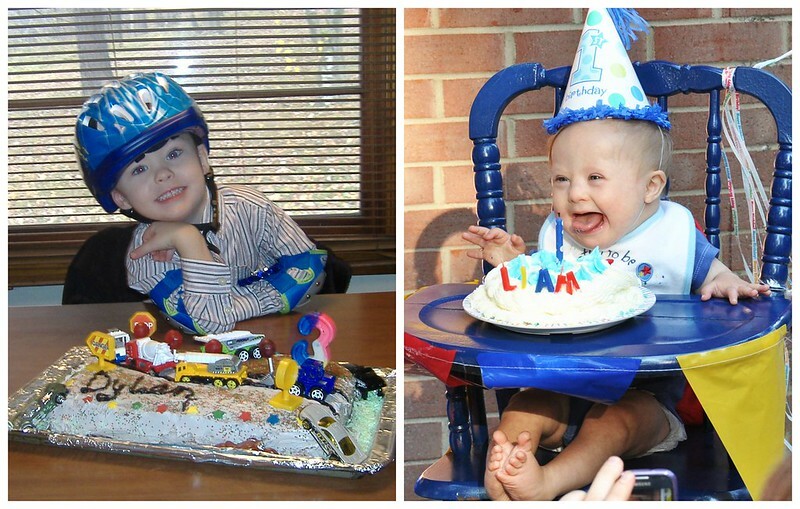 What kind of birthday traditions does your family have? 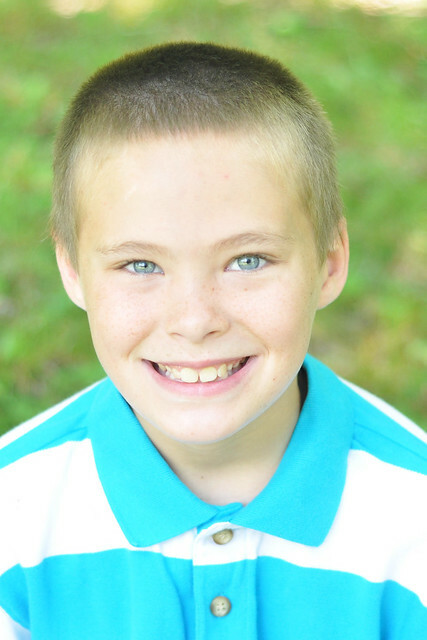 I said it before, and I will say it again and again: I can't believe I have a 10 year old!!! 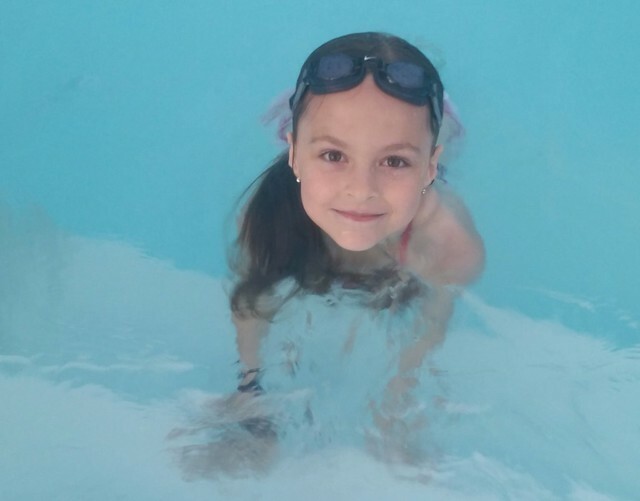 When we were expecting our first baby, I prayed daily for a girl. I wasn't sure I would know what to do with a boy. Even during labor and delivery, I kept hoping for a girl. But the moment I laid eyes on him, all my fears disappeared and I instantly fell in love. He was the most beautiful sight I had ever seen. ALL I wanted was him. Somehow I blinked, and 10 years passed by. Ten entire years. Gone by in a flash. And in that span of 10 years, my baby boy turned into a big kid. He no longer fits in my arms. I can barely pick him up. I can't even recall the last time I carried him. When he hugs me, the top of his head presses against my chin. 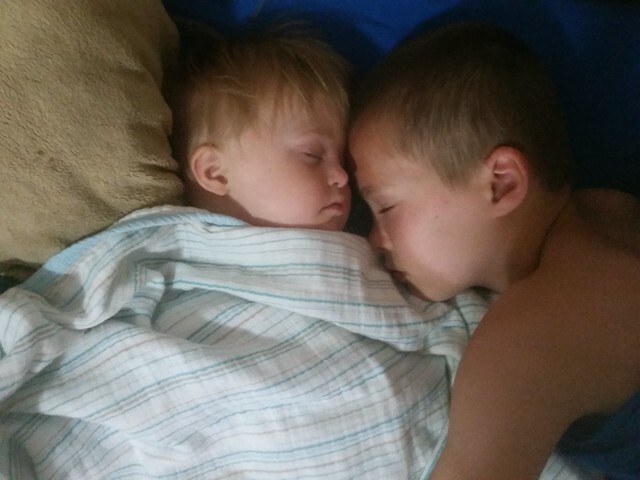 Those middle of the night trips into our bedroom to curl up in between us ended many years ago. He can do everything himself and rarely asks for help. I'd be lying if I didn't admit that I definitely feel a disconnection from him at times. He's growing up and growing away from us. My sweet, well-behaved, compassionate, loving, ANGEL of a boy is starting to show a hint of an attitude. He's starting to talk back and roll his eyes when we say no. 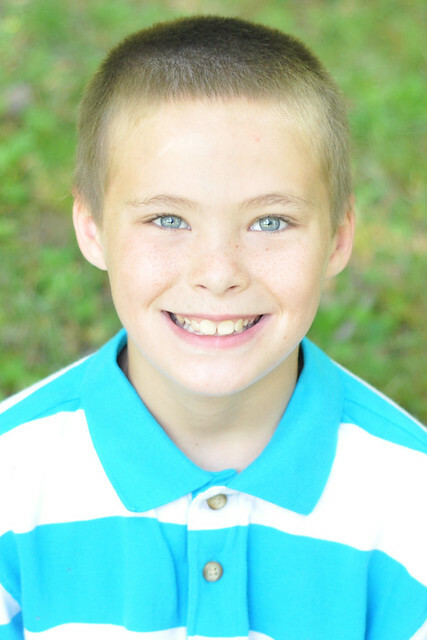 He gets bored staying at home and wants to have sleepovers with his friends as often as possible. I never thought this day would come. 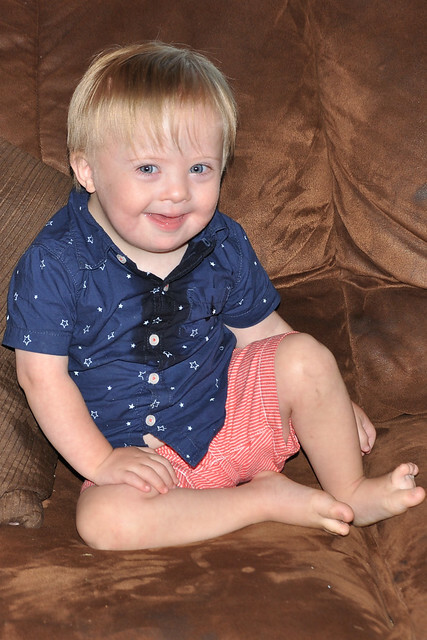 Although there are times when I have to bite my lip to fight back a scream of frustration, that incredibly sweet, innocent, loving, compassionate boy is still there. His teachers and other parents rave about him. He treats everyone with kindness and compassion. 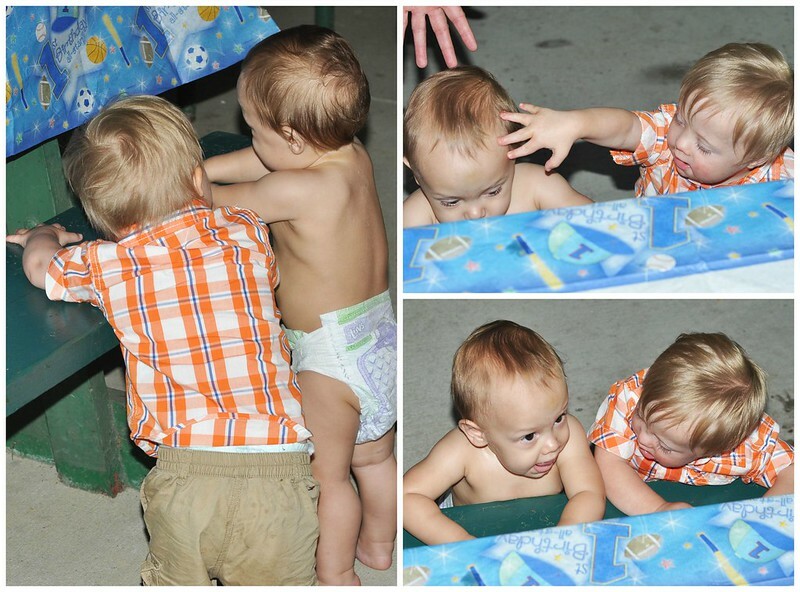 He is an incredible big brother and his love for his siblings is evident in every picture I take. He is SO good that it makes those frustrating moments when he's testing us so much harder to deal with. 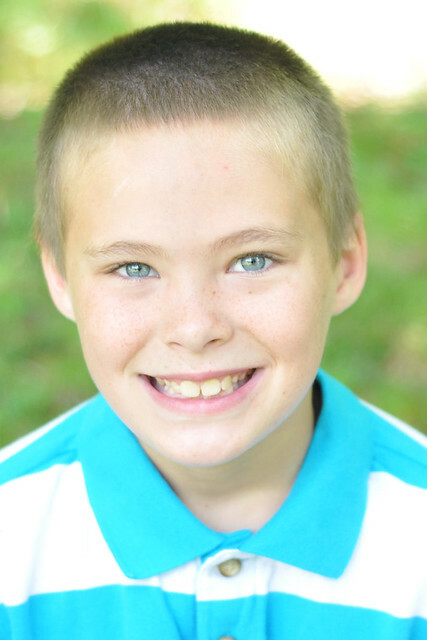 He's growing up, but I see that sweet little boy every time I look into his eyes. 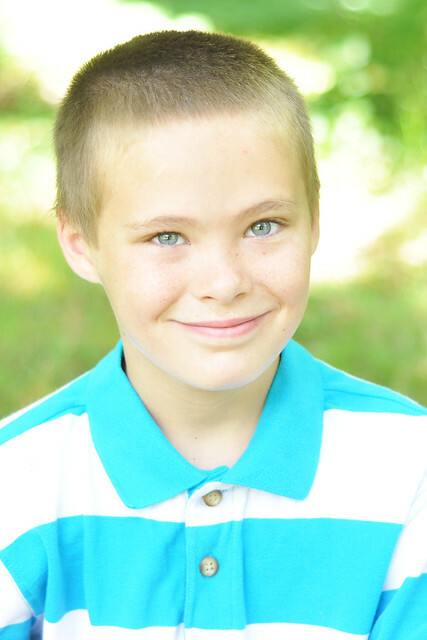 Those same big blue eyes that gazed into mine when he was a preterm newborn. That shone with pride as he took his first steps toward me. That filled with tears when he got hurt. That begged me not to leave on his first day of school. That filled with love every time he met a new sibling. That sparkled with happiness almost every single day of his life. Those same eyes that are able to express without a word just how much he loves his family. And when he stares at me and smiles, I realize nothing has really changed. 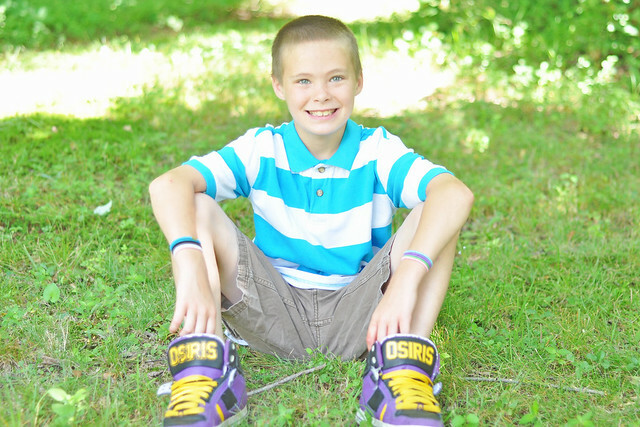 Dylan is truly an amazing kid and I am absolutely HONORED to be his mom. 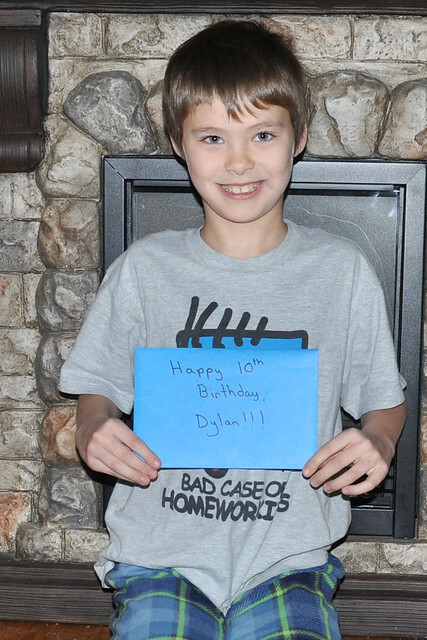 TEN YEARS OLD. Yep. I'm still in denial!!! My sweet baby boy, he will always be! Creating a collection of Busy Bags was at the top of my To Do List this summer! My goal was to complete them before our vacation at the end of August, and time was rapidly running out. I finally began to peruse my Pinterest board, and although the ideas were incredible, I didn't have the time to make things from scratch. I had to come up with another idea! It's no secret that I love the Target Dollar Spot! I mean, who doesn't get sucked into the bins of $1 and $3 must have items?!? 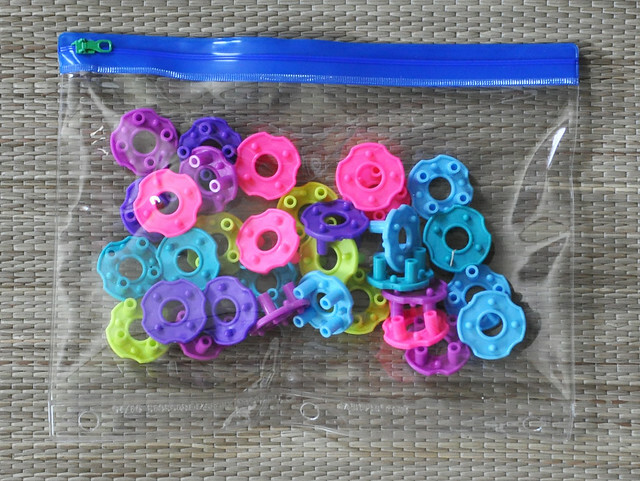 A few weeks ago, I was searching through the bins for items to keep our kids busy on our road trip, when it hit me: Why not use those items in Busy Bags? It made complete sense! At the beginning of the year, I made activity packs for Lily to play with while Liam was having therapy sessions in our home. It was a great way to organize large groups of items. I keep them in a storage ottoman and we still use them daily! 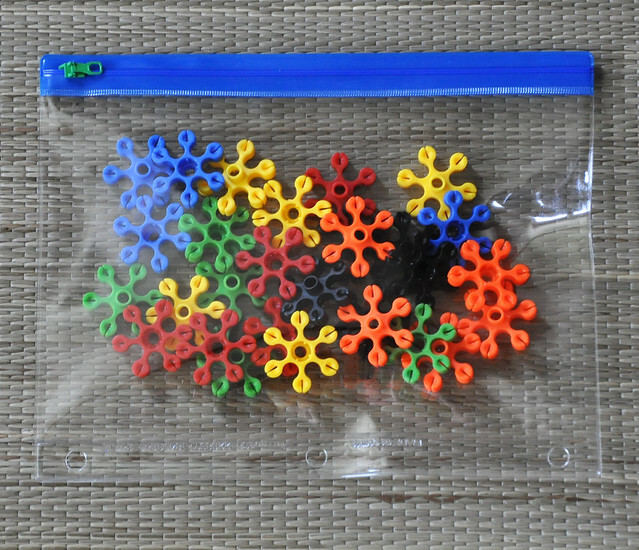 Although we love the mesh activity packs, I wanted something that was easily portable. 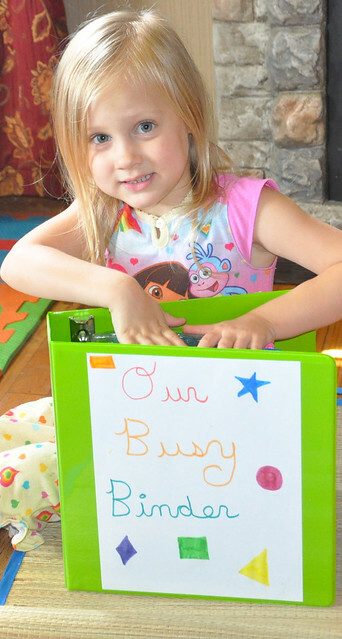 I wanted a wide variety of items that could be played with in our home, then stashed in our car for play on the go. 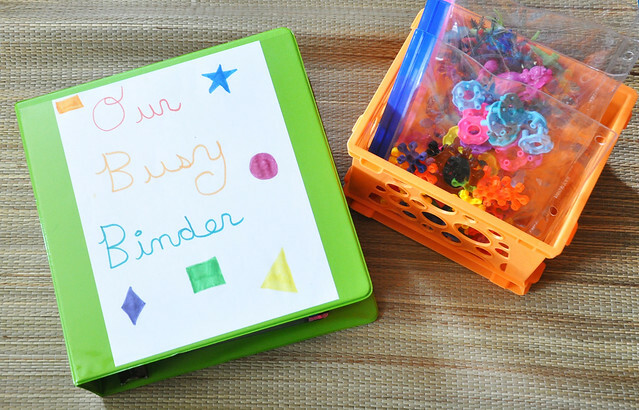 Enter the Busy Bag Binder! A trip to Target was in order! 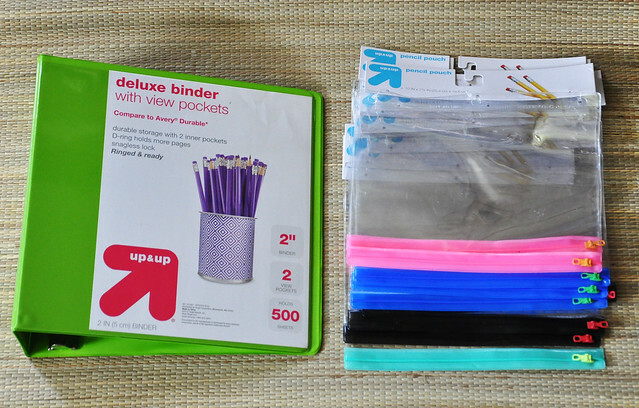 I picked up the largest binder I could find, bought a bunch of clear pencil pouches (with binder holes) that were on sale for well under a dollar each, gathered some Dollar Spot items, and went to work! 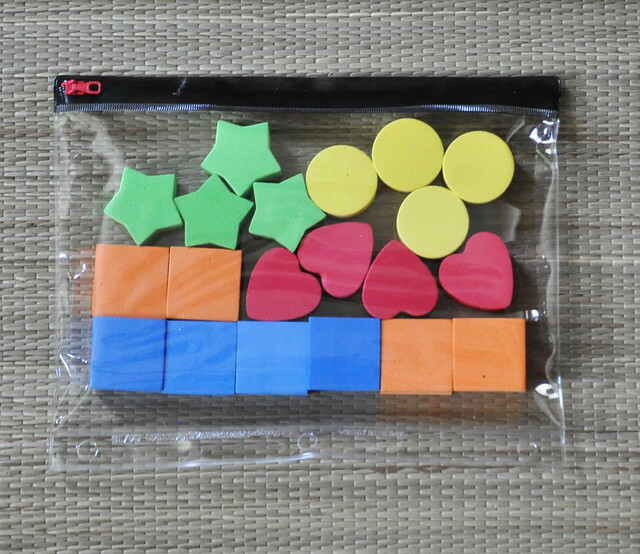 Counting Blocks ($1)-Great for teaching Lily basic addition and subtraction, but they can also be used as building blocks! 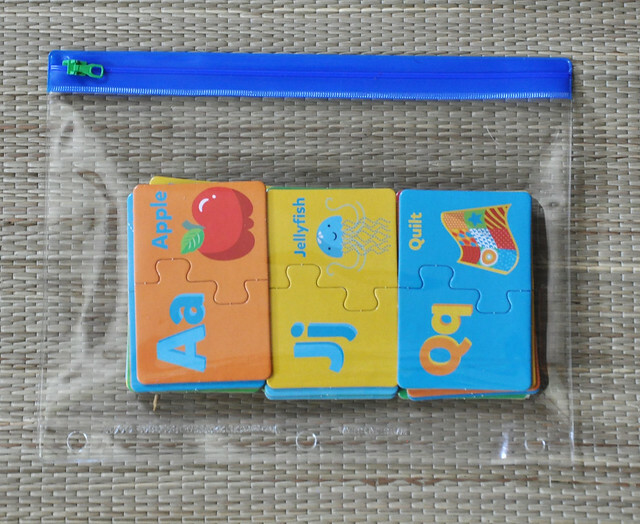 Alphabet Learning Puzzle ($1)-A great matching puzzle perfect for practicing letter recognition! Building Blocks ($1)-Girl colors for Lily! She loves building towers with them! 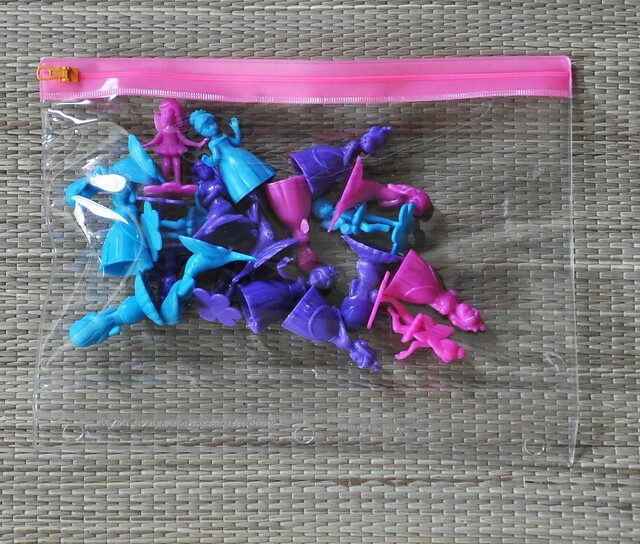 Fairy Tale Friends ($1)-Mini figures for pretend play for my girls. 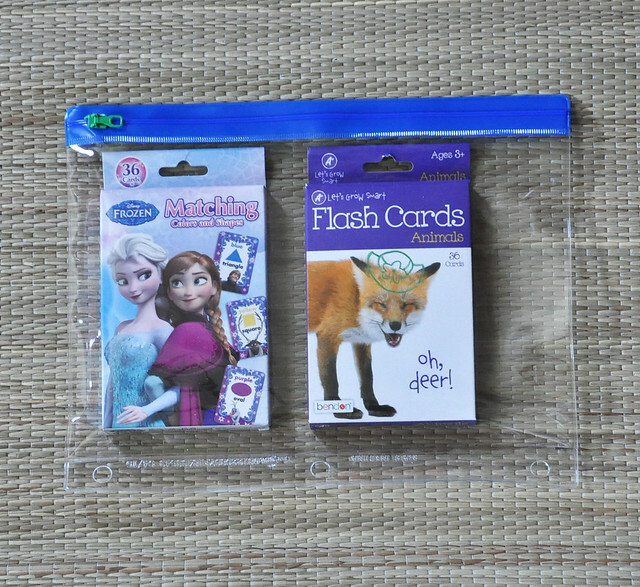 Frozen Matching Game ($1) and Animals Flash Cards ($1)-A game for the girls and flashcards for Liam. 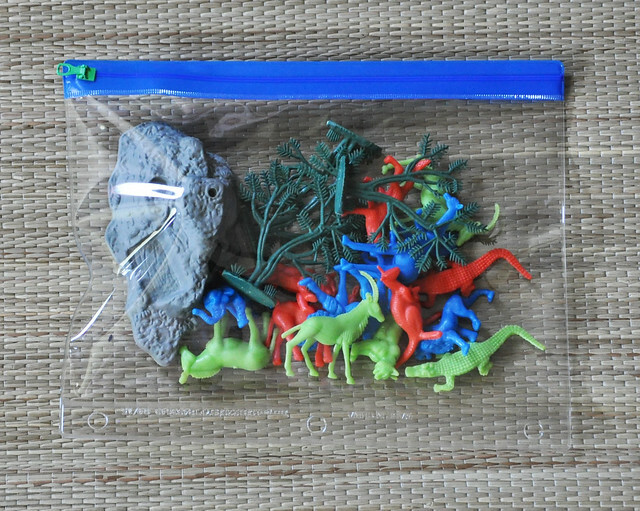 Wild Animals ($1)-Pretend Play figures for Liam. 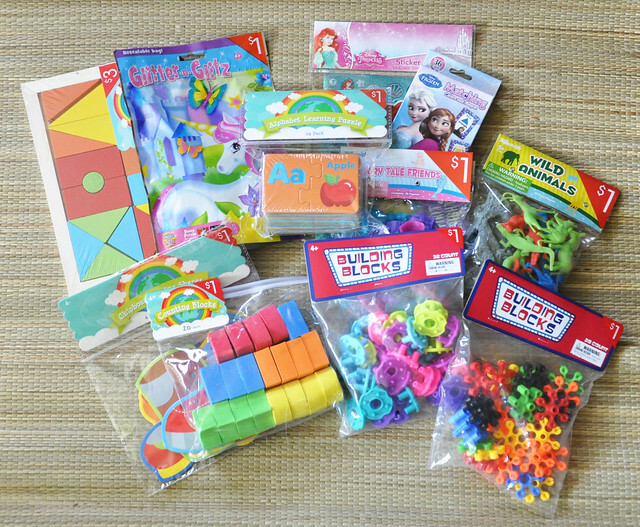 Building Blocks ($1)-Different shapes and colors, but just as much fun! 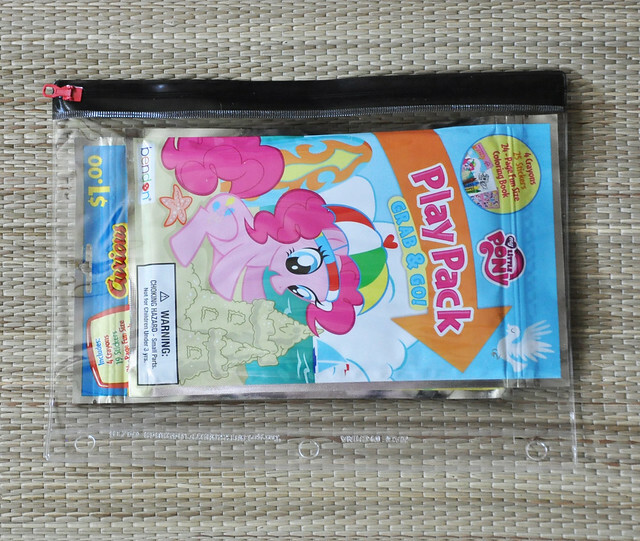 Curious George Play Pack ($1) and My Little Pony Play Pack ($1)-Crayons, Stickers, and a coloring book in each pack. Chipboard Lacing Shapes ($1)-Lacing shapes help with fine motor skills! Glitter n Glitz Puzzle ($1)-A more complicated puzzle for Lily. 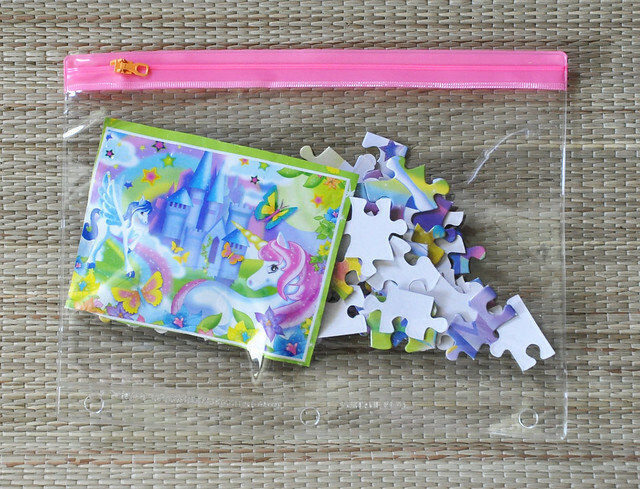 I cut out a small picture from the bag the puzzle came in to use as a guide and placed it in the bag with the puzzle pieces. 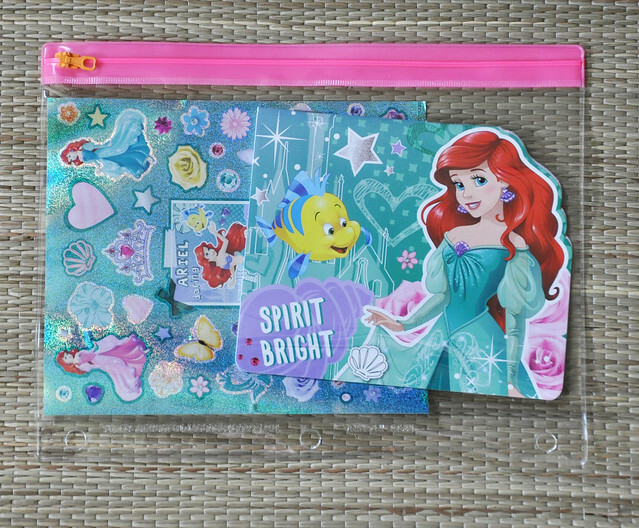 Sticker Album and Stickers ($1)-This one is mainly for Lily. She loves stickers, and I love that she can fill up a keepsake album! 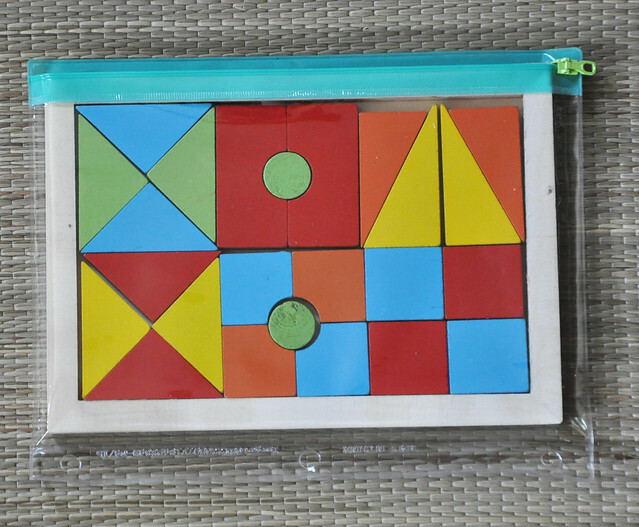 Tangram Puzzle ($3)-I spent the most money on this item, because it was a higher quality wooden puzzle. Lily has to think harder to put it together and Liam can play with it, too! 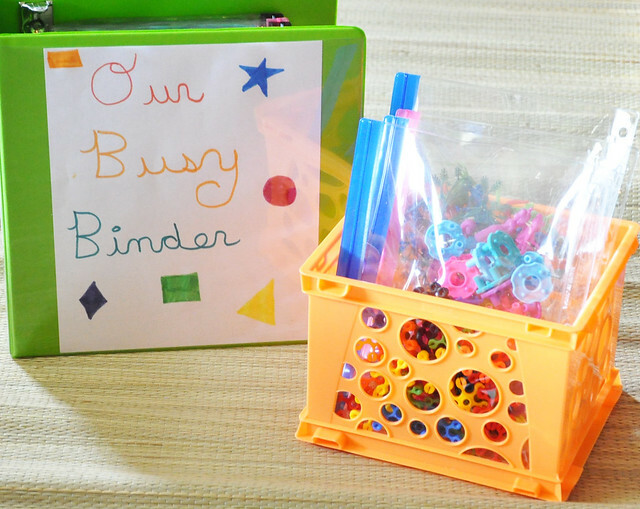 Once the Busy Bags were assembled, it was time to put our Busy Binder together! I created a simple cover and asked Lexie to draw some shapes. I slipped the cover into the front binder pocket, then chose 8 Busy Bags to keep in the binder. 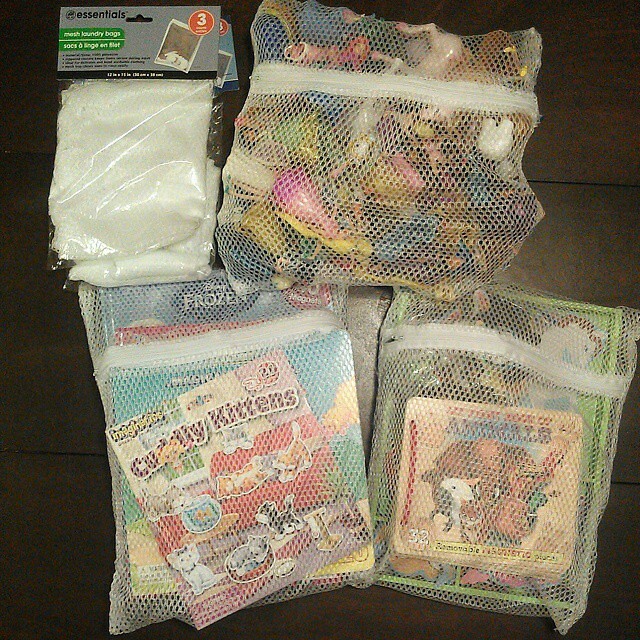 I stored the 4 remaining Busy Bags in a mini crate, and plan on swapping the bags every week. 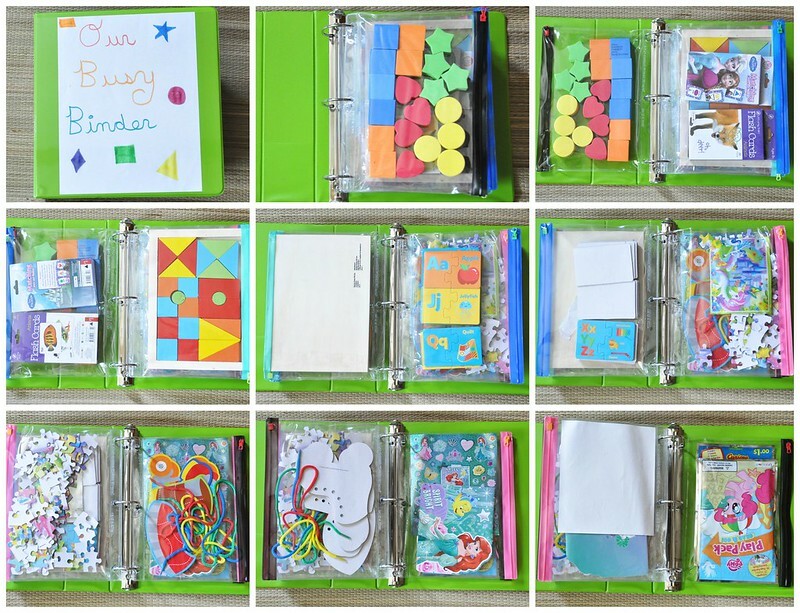 I was thrilled with the way my Busy Bags Binder turned out! 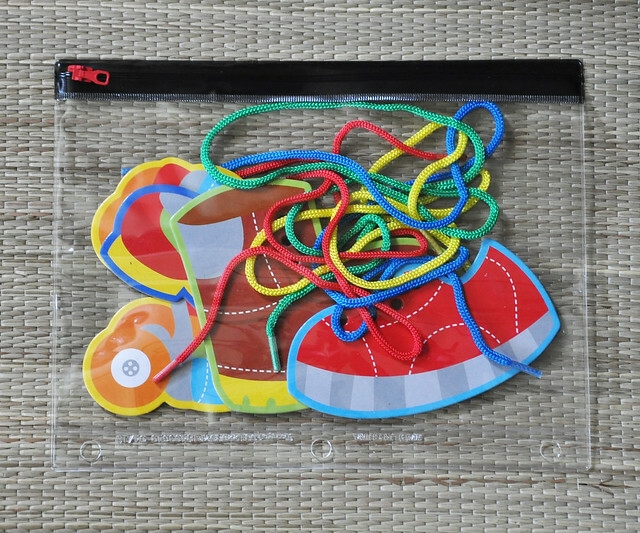 The Busy Bags can be easily removed for play, then returned to the binder afterward. We have a strict "You must clean up one Busy Bag before you get another" rule in our house! Stay tuned for another round of Busy Bags coming your way soon! 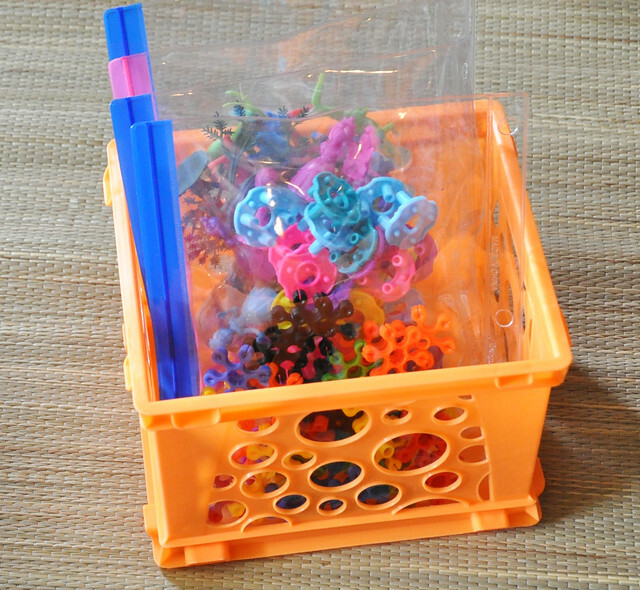 The next batch involves paper clips, flash cards, pipecleaners, golf balls, beads, rope, pool noodles, clay, and more! 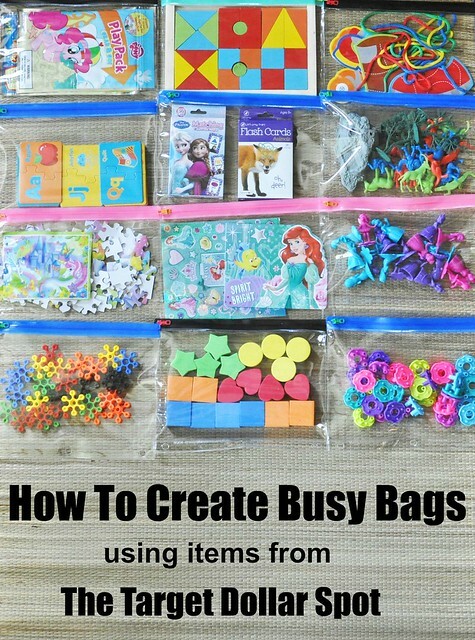 Do you have Busy Bags for your kids? July is passing by SO quickly! I'm sure our non-stop busyness isn't helping matters much, but it feels like this month flew by exceptionally fast! On Monday, Liam had OT in the morning, then we met friends we haven't seen since January at the park, then stopped at Target on our way home. That evening we had our weekly Family Movie Night after dinner! On Tuesday, my niece, Aubrey, was with us for the day, Liam had PT in the morning, and Lily had her last summer storytime session at the library. 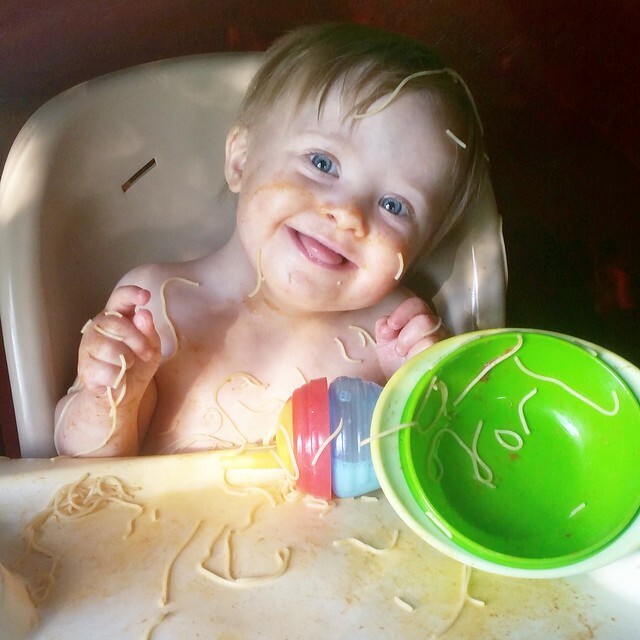 Then, of course, SPAGHETTI NIGHT! 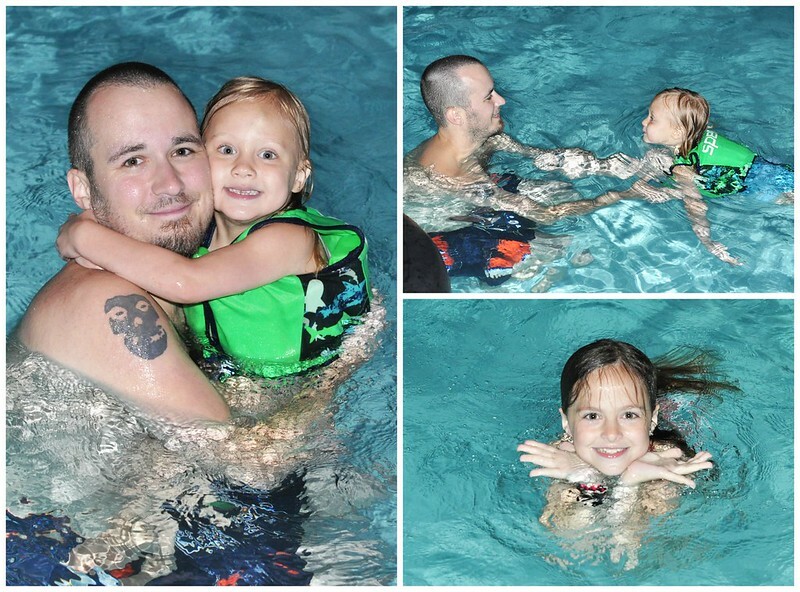 On Wednesday, I watched Aubrey, and we spent our afternoon swimming! Me + 6 kids alone wasn't too bad, and my friend eventually showed up to keep me company! On our way home, we had to stop at the grocery store (AGAIN!). 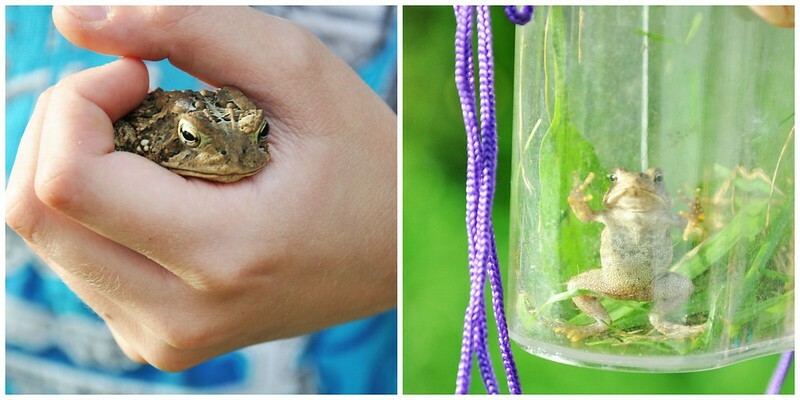 That evening, our family worked together doing yardwork, and the kids found some toads! 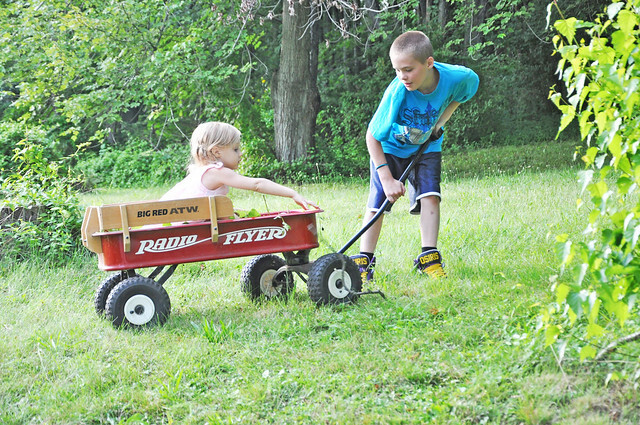 My husband ran the big one over twice with the lawnmower, and it miraculously survived. 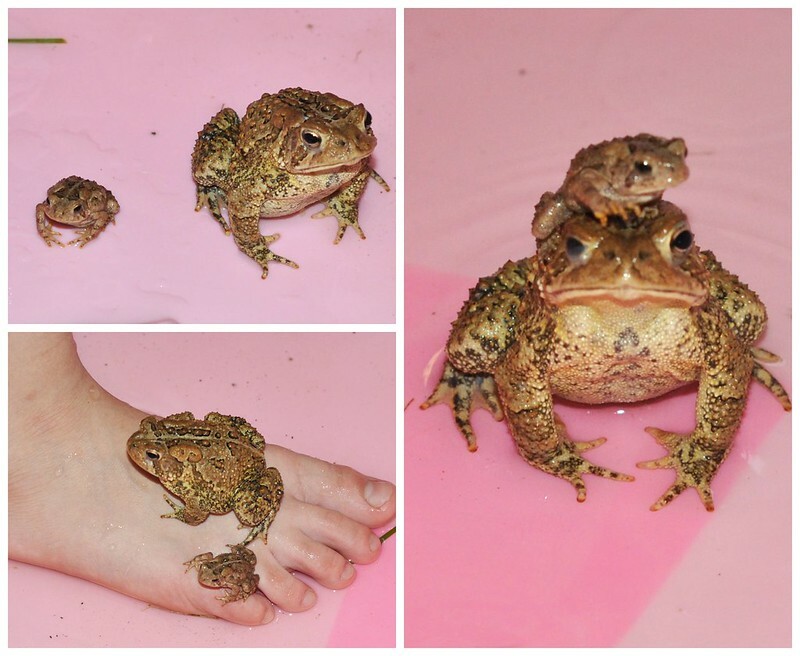 The kids were so excited, so we let them keep them overnight! On Thursday, I watched Aubrey again. We ended up having a somewhat quiet day at home! 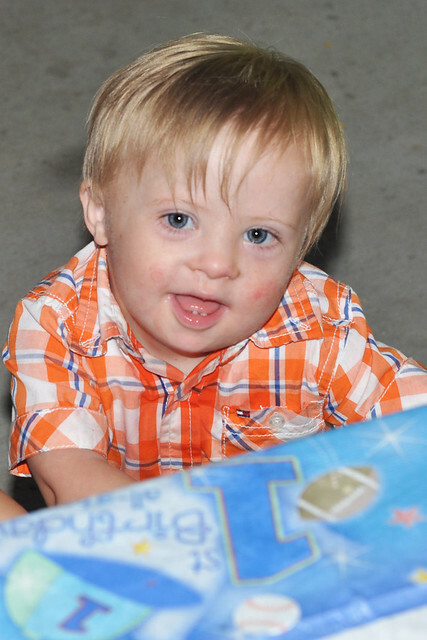 On Friday, it was Grant's birthday! Unfortunately, he had to work, but I woke up early to make him a special birthday breakfast! Shortly after he went to work, Aubrey was dropped off, and we got ready to go to the park. 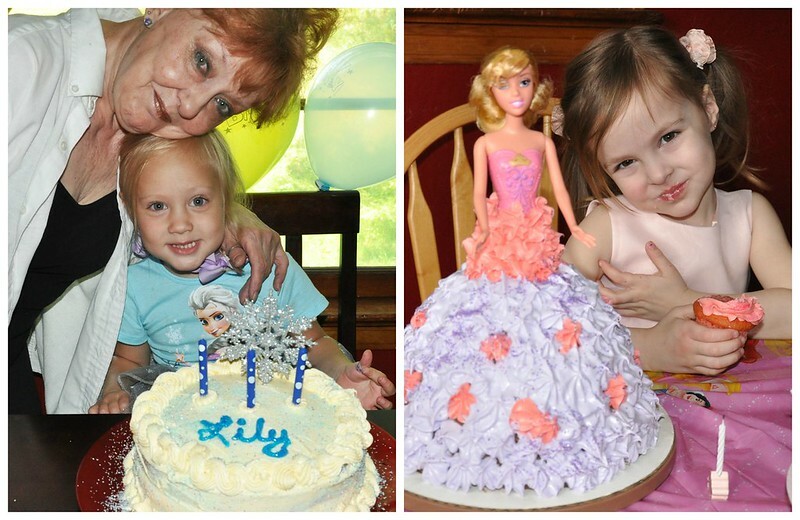 It was Lily's best buddy Lily's birthday (yes, you read that right! ), so we had to celebrate! From there, we went to visit my parents for the day. After having dinner with them, we dropped Aubrey off, and stopped at home so the kids could give Grant his birthday presents. 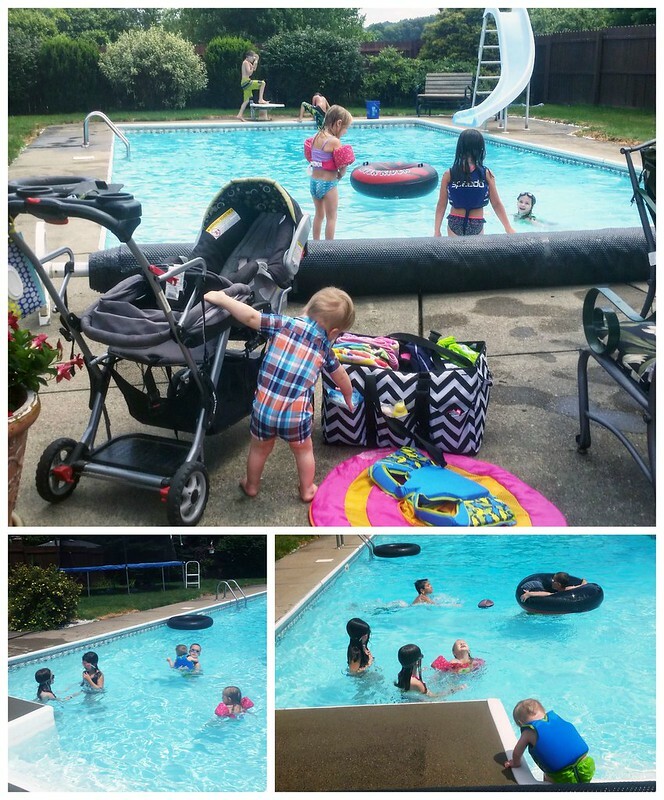 After that, I dropped Dylan off at his friend's house to go camping, and the rest of us went for a night swim to celebrate Grant's birthday! On Saturday, I picked Dylan up from his sleepover and we stopped at Target on our way home. 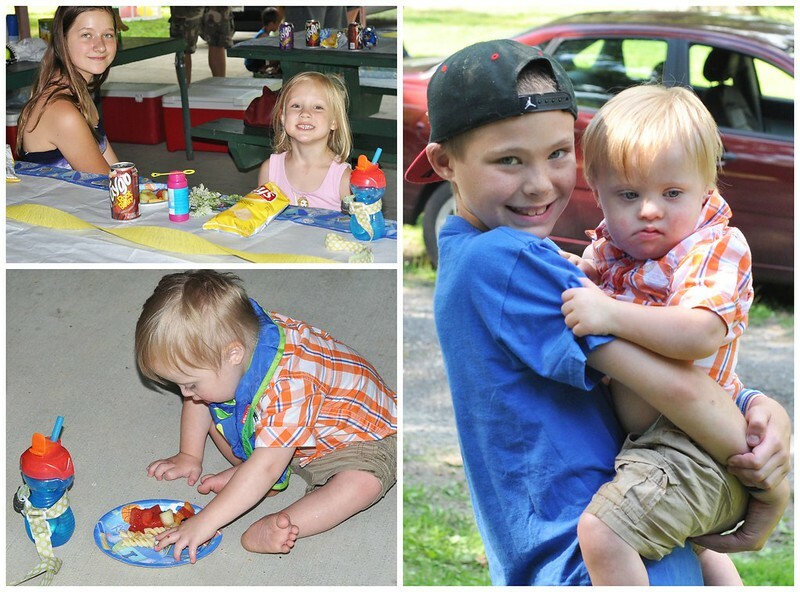 Grant's mom came to our house to visit for a while, then we headed to the park for my great nephew, Bentley's 1st Birthday Party. My parents kept our kids while Grant and I went out to dinner alone to celebrate his birthday. We went to Red Lobster and had a great time! We picked up Liam and went home to watch movies. Lily decided late that night that she needed to come home from her sleepover at my parent's house, so my dad dropped her off. Of course, she fell asleep in the car! Since the two little ones slept so well, Grant and I were able to stay up late watching movies and TV shows! We had a great night together! On Sunday, we were able to sleep in. My dad brought Dylan and Lexie home early that afternoon. Lily and I left for a few hours to do the grocery shopping and run to Target (we went there a LOT this week). It was nice spending time with just her! When we came home, we had dinner, then Grant and Dylan ran out for a few hours while I cleaned, did laundry, and bathed everyone.When Grant got home, we let the kids play for a while, then put them to bed.We ended our night watching a few episodes of Gilmore Girls and Frasier on Netflix! 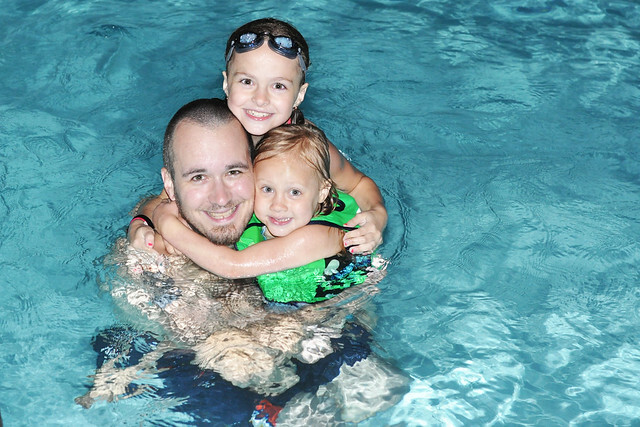 It was a really busy week, and there isn't an end in sight until after Labor Day. At least our schedule is filled with a lot of fun stuff! August is going to be GREAT!